Darien’s Brian Minicus (#1) takes a shot on Wilton goalie Andrew Calbrese as Wilton’s Tyler Previte (#33) defends during their game on Saturday at Darien High School. DARIEN — It took the high-powered Darien offense roughly nine minutes to get going Saturday against Wilton. Once it did however there was no turning back as the Blue Wave rolled over the Warriors 17-3 to remain undefeated on the season. Darien, which is No. 5 in the Under Armoud/Inside Lacrosse national poll, was paced by Kevin Lindley and his seven goals. After Lindley scored the first for the Wave (7-0, 4-0 FCIAC) Kniffin added four goals and two assists while Minicus and Hamill orchestrated the offense with four assists apiece. Wilton took the lead in the contest on a goal from Connor Drake and added one in the second from Brian Calabrese and third from Kieran McGovern, but it wasn’t enough against the driven Darien team that didn’t overlook the matchup with the Warriors (3-3, 1-3). Wilton tried to hang tough behind dominance at the faceoff X from Rocco Romeo but couldn’t capitalize on all the extra possessions. 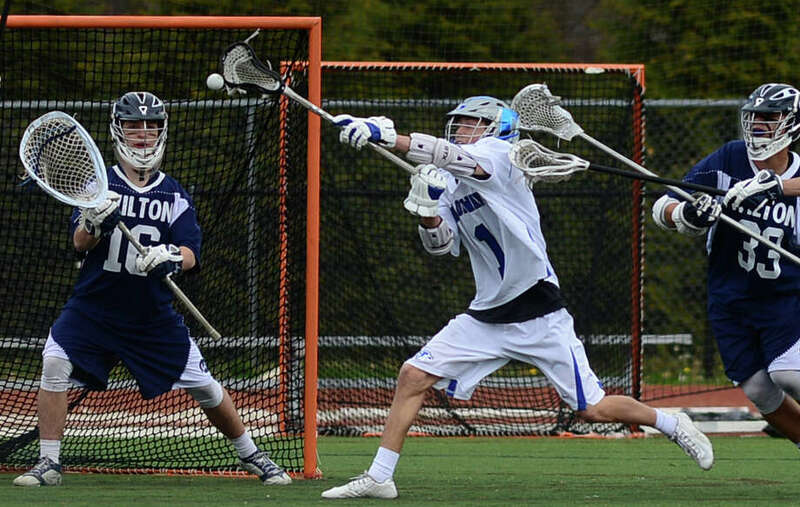 Darien has been perfect so far this season; after defeating New York teams Manhasset, Niskayuna and Yorktown the previous three Saturdays, the slate gets even tougher next week with a home matchup against archrival and UA/IL No. 7 New Canaan. Records: Wilton 3-3, 1-3; Darien 7-0, 4-0. Scoring: W—Connor Drake 1 goal, Brian Calabrese 1g, Kieran McGovern 1g, Harrison Bardwell 1 assist, Joseph Murtha 1a; D—Kevin Lindley 7g, Jack Kniffin 4g 2a, Riley Stewart 1g 1a, Colin Minicus 1g 4a, Liam Rischmann 1g, Jake Kirby 1g, Tanner Strub 1g, Jack Book 1g, Hudson Hamill 4a, Finlay Collins 1a. Goalies: W—Andrew Calabrese (5 saves), Matthew Brody (1); D—Ryan Cornell (5 saves), Andrew Clarke (1). Shots: W—20; D—39.